AI Planning is a masters level course taught at the University of Edinburgh School of Informatics by Gerhard Wickler and Austin Tate. A version has been prepared for on-line and distance education uses and it has been presented as a MOOC on the Coursera platform. Work is now underway to make the materials available in a number of formats and on a number of video streaming platforms. 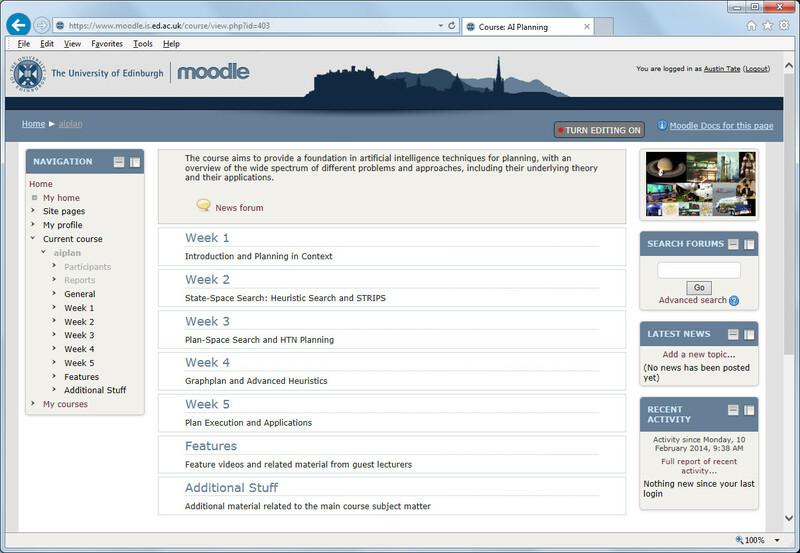 As part of this work an “AI Planning” (shortname: “aiplan”) course has been established on the University Moodle VLE. These are in a new category for courses that are not ones that have separate sessions each year. The new category is for “Ongoing Courses” as suggested by me for this sort of course. This entry was posted in Informatics, MOOC, Moodle and tagged Informatics, MOOC, Moodle. Bookmark the permalink.